Nurture members in the Word of God so as to grow in faith and hope and love. Stitching Angels: This group meets weekly at the church office of Redeemer Lutheran Church each Thursday at 7 pm. 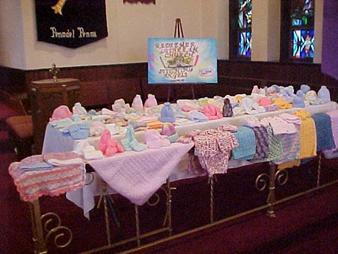 We knit, crochet and sew items to be donated to the NICU and maternity units of local hospitals. We make blankets, hats, booties, mittens, kimonos, chemo hats and sweaters. Annual Chili or Favorite Casserole Cook-off in January. Distribute Care packages to college students. Star Bright, Star Night stars based on gifts of the Holy Spirit are distributed to members who are encouraged to work on these gifts through the year. – February during Fat Sunday brunch.